These kind of short film celebrations of resilience are wonderful. Buckingham TT are on the hunt for a spot in town to make a relaxing herb garden and community sanctuary/space for all to enjoy. Transition Peterborough had their official launch (congratulations all!) at The Green Backyard. In case you missed it, here is the Transition Culture post by Naresh on T-Perborough’s recent Thrive training. TT-Honiton recently held a screening of In Transition 2.0 whilst TT-Exmouth put on a green energy evening, one of many events in their jam-packed newsletter which included planting up over 70 trees. 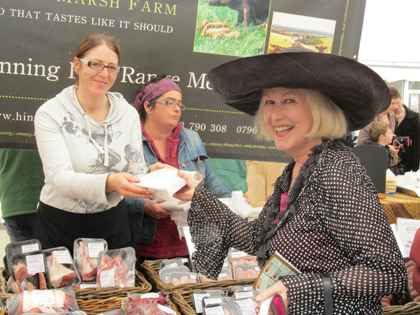 In Wivenhoe, the local Farmers Market welcomed the Transition café. T-Abbots Langley held a spot the window competition. Here is a lovely feature/ interview with Frances Beaumont, T-Faversham’s ‘Green Grandma’ who is often seen riding her trike around town! In Lancashire, the newly formed T-Garstang joined Soroptomists and Bloomers to form a Garstang Diamond Jubilee Garden. T-Clitheroe are currently working with Ribble Valley Borough Council (RVBC) to save Primrose Lodge. TT-Wandsworth held an open event at Bramford Community Gardens. 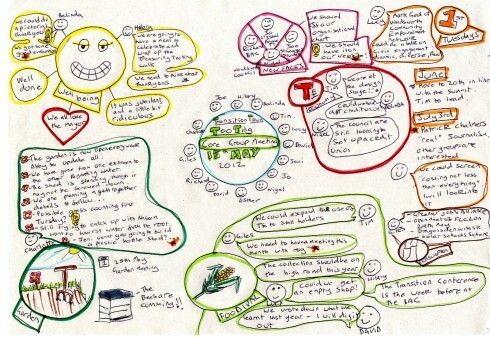 Check out TT-Tooting’s fantastic core group meeting notes (click to enlarge)! “Just wanna say a big thank you for putting us in touch with the wonderful women of Brazil. Hannah is off to Río next week and has made several contacts all over the country. Amazing age we live in and amazing family that is Transition! Am sending you pics of Transition Chichester at the Jubilee Procession last Sat…the whole parade was full of the consumer society in full array….we came near to the end, which suited us well, as the contrast of our effort made quite an impact…we decorated our bikes with flowers, leaves and the priceless trappings of simple Nature to be found on each country pathway and then with our new banner and new logo plus placards of what we TC is about…. “Just thought I would let you have the good news. 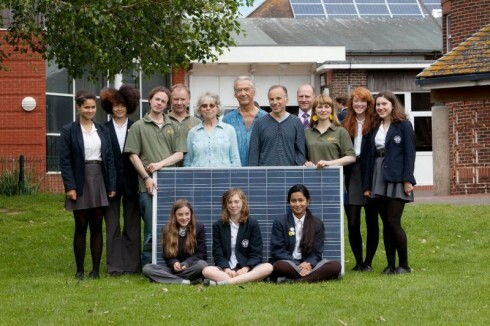 OVESCO have just completed a 35kWp PV array (140 panels) at Priory School in Lewes. It’s take over a year and I have become an associate governor at the school giving help to the Eco Group to make it happen. The School and the Governing body were very supportive, but it was the Schools Eco Group who relay inspired us to make this project happen. Prior to getting the project through planning we went to visit the opening of the Glyndebourne wind turbine and pupils from the school got to meet David Attenborough, who was very generous and supportive of renewable energy. Next term the Eco Group plan to use this project to recruit more members and some of the governors/TTL group want to help develop projects at the school around waste, food and energy efficiency. I have attached a wonderful picture taken this week at the school”. 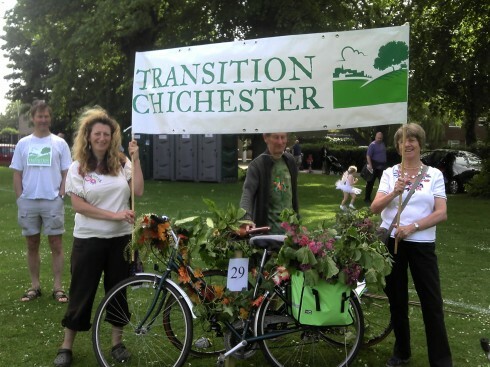 Transition Exeter (I love their logo, see right) recently got some funding, as did a number of other Transition groups, through the LEAF fund. Theirs “aimed to engage local communities and provide accessible information about energy efficiency through distributing leaflets, organising a doorstep survey and running Energy: Save it Yourself workshops in the three wards; to inspire by providing opportunities to learn from what others have already achieved; and to understand more fully the issues, attitudes and priorities of all parties involved to enhance dialogue and co-operation”. They wrote a great report about it which you can read here. 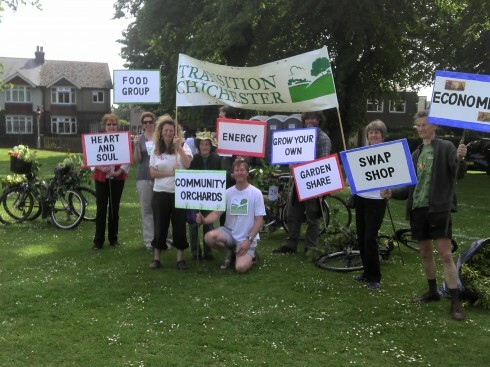 Transition Town Cheltenham’s work to create food gardens in Annecy Garden in one of the town’s parks is going from strength to strength. Read more here. “Yes, we are an official Transition initiative in the Southern Highlands of NSW Australia – Transition Shire Wingecarribee which essentially acts as a hub as the Shire covers such a large area. The community screening is tomorrow Sunday 10th June 2pm at the local Empire cinema in Bowral. The owner is donating the use of the cinema. Two local musicians have offered to perform live in the half hour before the screening. We do not have funding and are not charging for the movie, but using it to celebrate World environment Day (a few days late) and I will be giving a short presentation on the local Transition group prior to the screening, and a colleague is facilitating a discussion post-movie where we hope to seed and support smaller transition groups at the village level. The Deputy Mayor is attending and local Council has helped with publicity – a good experience to collaborate with local government and we hope it goes well so that we can collaborate more often”. “The day dawned in the mountains of Cantareira Forest in Jd. 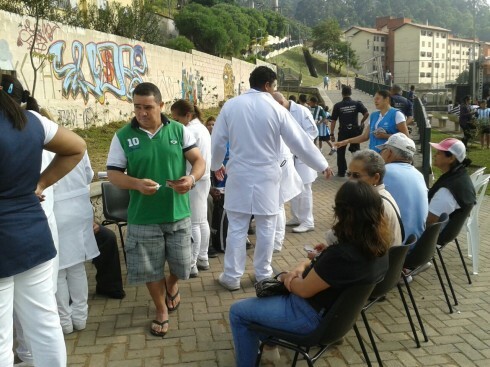 Damasceno, and the organization staff of the III Sustainable Health Fair, was already up to make it all happen. Enjoying the warm sun, the group started with a walking activity complete with yoga, breathing and prolongation offered by the ONG Art of Living, followed by soccer with children in the community. After the official opening, at the stage set by the city of São Paulo, the concerts of artistic groups did not stop a minute, starting with Group D’Rolê then Offset Band, Dance Wings of Faith, James and Timothy, Band Seven, ending with Krisma band. They also had Capoeira Game with the Genésio’s school. With synergy and harmony, many activities were held simultaneously, had a team of UBS making medical care, counselling on STDs and AIDS, with delivery of condoms and also not lack guidance on delivery of oral health and oral hygiene kits, the children loved it! The team of civil defence elucidated visitors about risk areas, handling gas cylinder and gas exchange of taps performed due. 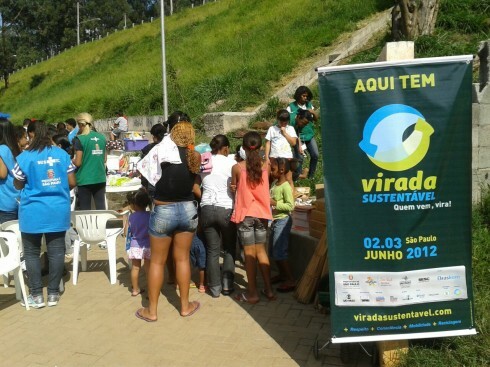 Residents of Jd, Damascemo could also rely on vaccination against rabies in dogs and cats, and rodents campaign against dengue offered by SUVIS, post service education Utility and Truck Aes-Eletropaulo; lot of fun with information. The crowd Arcade project was also present, recording the event, and offering workshops for kids and Stencil film shows. Other workshops also took place throughout the day, such as paper crafts with the girls at UBS, and tetrapack with mister Zagalo, a resident of Jd. Elisa Maria, not to mention the work of art made by Smoky, a street art local artist. The group participated in the Art of Living program with yoga and breathing in the morning and a tent for the dissemination of the Breathing course, Water and Sound (RAS) that is being offered in the community. The show was also part of sustainable turn, what was happening in São Paulo between days 02 and 03. Children’s books offered by the organization was a source of many smiles in the kids who passed by. Speaking of sustainability, besides the points of delivery of oil, battery, RX drugs and junk mail, even had the wish-fulfilling tree of the group Saci, planting trees provided by DGD-norte1 and model of sustainable home, work from the workshop of sustainability. Foods and drinks were served with By the Girls of Doces Talentos group, who also took their craftwork of crochet and embroidery to sell at the fair. Also in Brazil, May East arranged for Rob to Skype to a group of Brazilian permaculture designers and Transitioners who were celebrating 20 years of permaculture. The main organiser, Marcos Ninguem has taken Transition to Manaus, Joao Pessoa and Ametista and there were around 120 people from North to South of Brazil attending (see picture below). 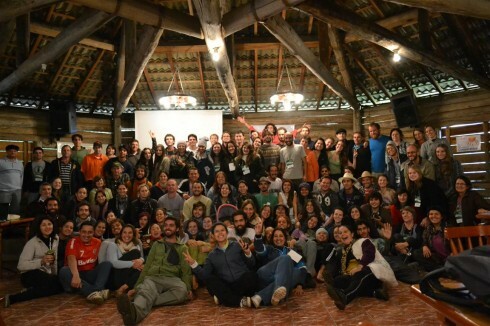 Participants on the Alunos-Fundaluz Permaculture Design Course. 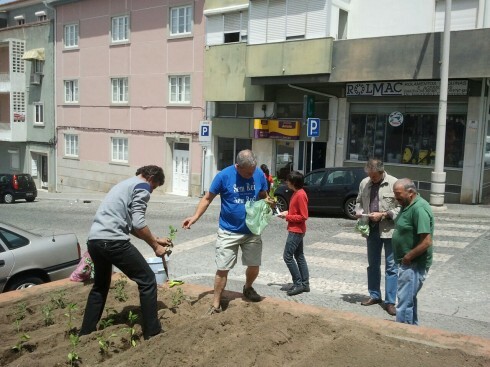 The ‘Sunflower veg garden’ in Portalegre takes shape. “The Transition Spanish Hub starts to Run! 16 and 17 June, took place in Madrid the first national meeting to specifically work on the creation of an Spanish national hub. We physically met 15 people from places like, Sevilla, Madrid, Bilbao, Valencia or Barcelona, among many others, and also people could participate virtually through internet. 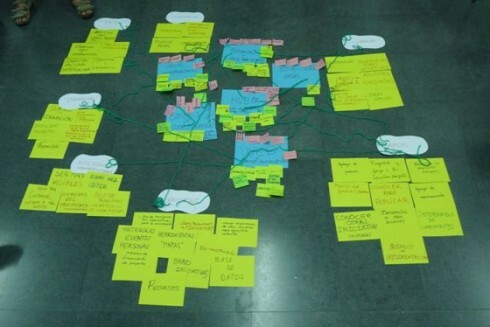 With a lot of energy and creativity, and the facilitation of Javier Zarzuela and myself, we worked on the first hub structure. This first hub, was design with the idea of “imperfection” in mind, because in our opinion perfection does not exist, is subjective, and what is importantant now is to function and to start doing. The ”Eje de Transición” as we’ll call the Spanish hub, starts now to run with a first structure, with a first group of people and working groups. That of course we’ll be changing and improving along the time, but now slowly and with its own rythem starts to work. 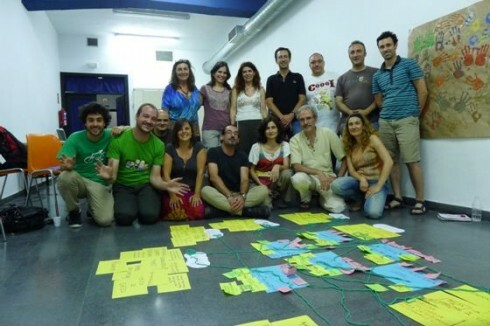 The amazing group that met in Madrid for this creating hub meeting. This step, after the first and very succesful Spanish conference , will definitely mean a big boost for the movement in Spain and hopefully will help on finding creative, practical and positive solutions for the difficult moments we are living, building like this local resilience and strenghtening communities”. You can also Read in Malaga Today how Transition is inspiring a film series being held monthly at Aboretum Marbella in the lead up to a Spanish national conference on 27th October 2012. Here is the June roundup direct from Transition US. Chris Chaney ponders how bicycling fits into the overall picture of permaculture and the Transition movement in this Colorado Transition blog piece. Hastings-on-Hudson (NY) becomes the 116th Transition Town in the US. T-Montpelier (VT) held their fourth annual Village-building Convergence in Montpelier and Brookfield enjoying a weekend of workshops, skill-shares, discussions, networking and celebration, read more in this article titled Getting to Yes through No. Here is a great piece about Transition Milwaukee (WI) who live up to their motto “we’re all in this together”. 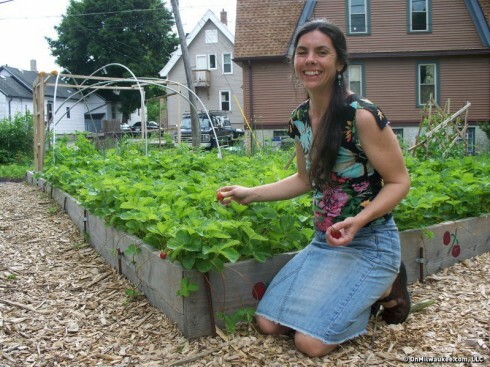 Transition Milwaukee member Sarah Moore in front of a community garden. Finally, here are a few general stories. An Al Jazeera feature asks the question Are we sustainable? of Richard Heinberg and Transition Network’s Rob Hopkins. Energy Bulletin recently featured a piece entitled Transition & Solutions. 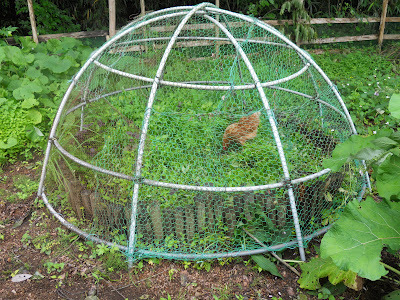 Permaculture College Australia gives an overview of Transition in this write up by Tommy Welham. In this (long) article on Tagorean World (site dedicated to Indian philosopher Rabindranath Tagore) Christine Marsh explores The Once and Future Village: From Tagore’s Rural Reconstruction to Transition Towns.